After discovering capacitive touch interactions with a Makey Makey device and an Arduino Leonardo, Jason Eldred realized it could also be used to control the Unity game engine. After a night of hacking, he had a basic interface that could change the scale of a virtual circle. From there, he teamed up with Alex L. Bennett to produce an art installation called Bee that invited users to interact with it by physically touching a panel to change graphics on the panel itself and a screen in front of them. While not meant as a game per se, after more experimentation including work by Gabe Miller and Dustin Williams, this interactive display method was finally turned into a virtual air hockey table via a giant crisscrossing grid of copper tape and wires. 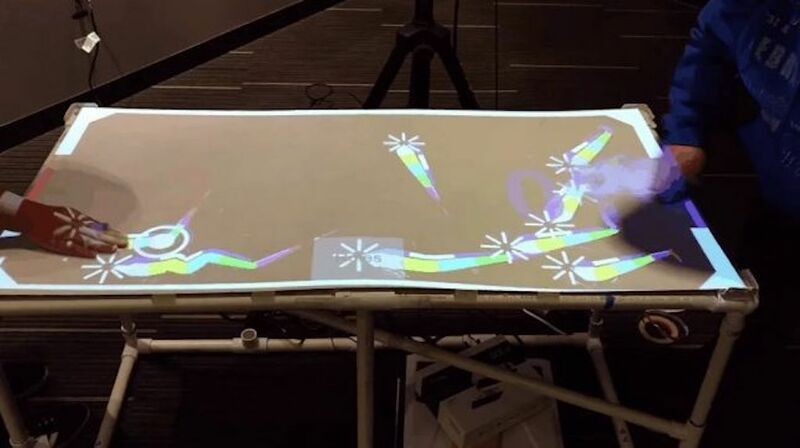 In the game, two players push a virtual puck projected onto a horizontal surface for colorful AR interactions at a very low cost. You can see it in action below, and read more about the project on DigiPen’s website and in Gamasutra’s recent article.